It’s a question on the minds of most students and their parents. Imagine if your child could earn well-respected recognition to highlight his or her college entrance application? + monetary rewards just for performing well on one test that takes under 2.5 hours? Well, let me introduce you to the PSAT. I wrote more generally about the logistics of the PSAT in a previous blog article. But in THIS article I want to talk more specifically about the scholarship money opportunities available to those students who work hard enough to do well on the PSAT test and qualify for them. About 1.5 million students take the PSAT each year in October, which also serves as the National Merit Scholarship Qualifying Test (NMSQT). The 50,000 students with the highest scores qualify for recognition. In September, the high scorers are notified through their schools that they have qualified as either a Commended Student or Semifinalist. Semifinalists are notified by EARLY September, Commended Students received letters of commendation in LATE September. To be considered for a National Merit Scholarship, from there Semifinalists must advance to finalist standing in the competition by meeting high academic standards and all other requirements outlined by the NMSC. Learn about requirements for becoming a Finalist in the 2013 National Merit Scholarship Program. Finalists: In February, about 15,000 semifinalists are notified that they have advanced to be named a finalist. High school principals are also notified and provided with a certificate to give to finalists. *Keep reading & see chart below for colleges/universities who will give you scholarship money to attend their institution if you are a Finalist! Winner Selection: All winners of Merit Scholarship awards are chosen from the pool of finalists based on their abilities, skills, and accomplishments with no attention paid to gender, race, ethnicity, or religion. 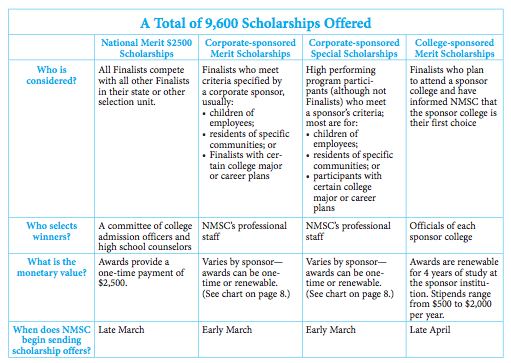 NOTE: Corporate-Sponsored “Special Scholarships” covered in next section although it appears on chart above. Single payment awards OR may be renewable for four years of undergraduate study. (About 1,000 are given annually). Corporate sponsors of these awards can designate qualifications such as: children of their employees or members, residents of a community, or finalists with career plans the sponsor wants to encourage. If you were part of the 2/3 High Scorers who received a letter of commendation, you’re not out of luck! 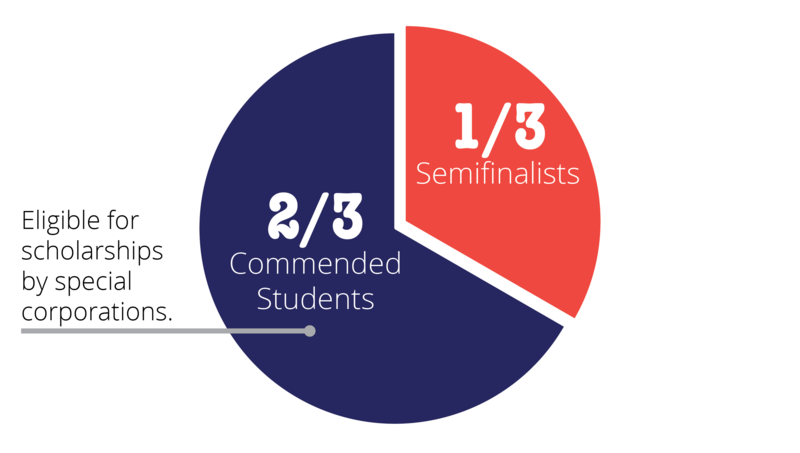 About 1,300 of awards are give out annually to students who were not finalists, but who meets the sponsor’s criteria and files the sponsor’s separate entry form. Here is where top scores on this one test can REALLY PAY OFF. Semi-finalists and Finalists are many times comped their entire undergraduate program’s worth of tuition. Sometimes they even get scholarship money on top of tuition for books, computers, other fees, housing, etc. Here is a list of some examples of schools that offer money to attend their undergraduate programs if you score well on the PSAT. Please check with the school for updated information and how to take advantage of these scholarships (some details may have changed). Below, “full ride” refers to paid tuition, room, and board, and “plus” means they may give an additional stipend to cover some or all of book costs, fees, technology purchases, etc. As you can see, there is a HUGE opportunity here for students to get incredible sums of money for their undergraduate careers! They just have to do well on ONE test that takes less than two and a half hours to complete. While the test “counts” toward qualifying for the National Merit during the student’s second-to-last year of high school (usually junior year if on a ‘typical’ schedule), students can take the exam once a year, every year, in October prior to this for real practice! Plus, there are classes available to help students study for the exam! This is an amazing opportunity for students and parents to invest a little time and money upfront for a potentially huge payoff later. At Student-Tutor, we specialize in SAT Prep classes, and since the PSAT is a precursor and predictor of success on the SATs. How young should your child start? 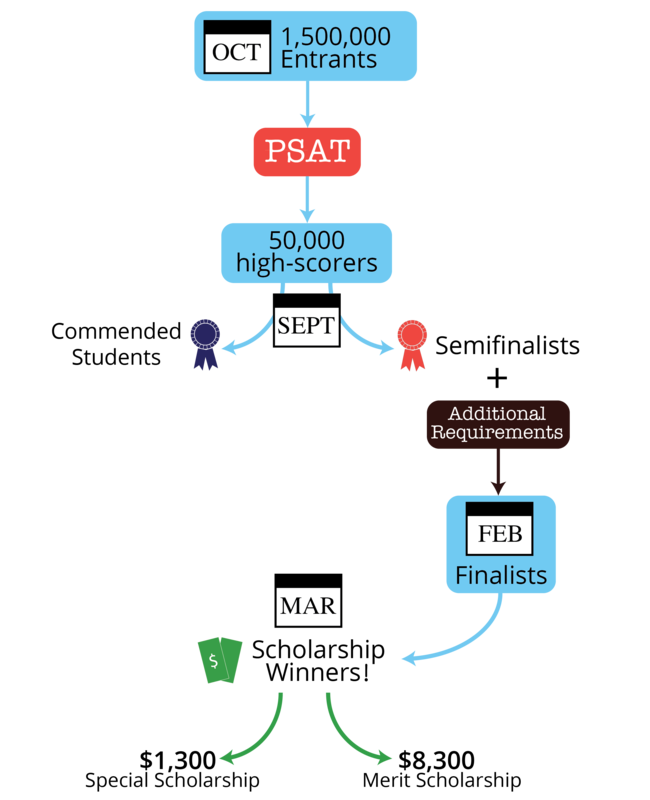 Know a student who has benefited from taking the PSAT, or have any additional questions about what steps you should take? Let us know in the comments below!